It’s finally here! My first work published in this months Cloth, Paper, Scissors. Laurie Blau-Marshall got to see it first and called me last night. She was a sweetie and scanned it for me and my issue arrived today. What a feeling opening a favorite magazine and seeing your work in there. I hope I will be able to work with them in the future. I love their publication and inspiring articles. Thanks for all of the happy dancing with me, this is a great start to an artistic 2008. Mine are the three collages on the bottom half of the page and the letter next to it. Joining Seth Apter’s quest for ‘Buried Treasure’ gave me the opportunity to go back to the early posts of my then fledgling blog and recapture some very special moments. The most memorable and what I consider the start of a whole new venue in my art life, was the publication of my first work. Was it only a little over a year ago? It hardly seems so as so much has happened since. With the validation that came with this first little publication, I was encouraged to submit more work and the result is over a dozen articles and publications that have followed. I was even honored with a Guest Artist feature in The Stampers Sampler. And the most amazing thing, each time I find out something is going to be published I do that same little happy dance! Each time it makes me want to do more, to strive harder, to stretch my artists soul to that next level. I did not know I could write articles for magazines, I just knew I wanted to be fearless and try. I set goals for myself and did not let myself off the hook. When one goal was met, I added another. I think when you truly want something you will go after it. You will find your way. You will do things you never thought you could do. I just posted a new slide-show featuring pages from my first artistic journal. I officially finished it this week. No white spots left! It was a wonderful experience for me and I have learned not to be afraid of a blank page! It was intimidating to me at first. But I jumped in and just learned along the way. Now I am so excited to start my second one! This has been an valuable tool in trying out new techniques, documenting happenings in my home life, my artistic life, and just plain fun! I take it with me on airplanes, doctors appointments and school pick ups. It isn’t perfect, but that’s one thing I learned along the way, IT DOESN’T HAVE TO BE!!! I kept going back to pages and adding things which was really fun, but I am ready to move on to Book 2. This first journal taught me so much and now I’m starting journal #13! When I submitted some pictures from the first one to Somerset, they contacted me about doing an article in the inaugural issue of Art Journaling. It was a little scary letting go of my first journal and allowing it to be used without my having control over it, but the end result was one of my favorite features and I am thrilled that they are even using more of that journal and some of a journal I did this year for the latest Art Journaling due out September ’09. Journaling is such a part of my art life, I don’t know what I did before I started. My views have totally changed about it. I am no longer striving to make ‘perfect’ pages, I am just enjoying the process of it and letting the pages unfold before me. I love it so much that I am sharing my passion in two online workshops, and still journal almost daily. If you haven’t added journaling to your art life, I would highly encourage it. I don’t look at it as yet another ‘thing’ to do, this is something I do for me. I share about it because I want people to know how truly do-able it is and how to fit it into your daily routine, making it a habit that has untold benefits. So what are your buried treasures? Have you looked back from whence you came in awhile? How did you get to here? Art is a journey. It does not stand still, it is continually evolving and taking new directions. It is important to look back to fully appreciate the path we are on. Great choices to repost Pam. Glad you used this opportunity to share the wonderful things that have happened for you from your art!! Thanks for joining in. Thanks, Pam. I did see you in the most recent issue of Stamper's Sampler but not the one with you as guest artist. Maybe the back issue is still available–I hope so. Congrats of your publication Pam! Always exciting…..
OMG! How wonderful! Congratulations on your publication, you most be really proud and it`s very well deserved!By the way, I wanted to wish you a Very Happy, Happy Birthday! :)Much success for you in this new year!Have a great one!Cheers…Moni. I loved your article in CPS! Hey, congrats on your articles! You go girl! So glad you joined in with Seth's buried treasure Pam. I'm alays popping in here for a looksee and find it constantly inspiring too! Really loved the video of your portraits recently, thanks for posting it! Nice to know the joy of being published and the thrill it gives is still that, a thrill! congrats pam! i love CPS magazine too! it will be such a delight to get my issue and see your work up close. i'm proud of your accomplishments. it couldn't happen to anyone nicer! Thank you all:-) Your sweet words make my heart smile and keep me inspired. Pam:You always seem to be in my favorite magazines. I missed you in the Stamper's Sampler, however. When was that. Will add to the chorus saying that your art is phenomenal and that I've learned a lot from you. You deserve all of your success! how wonderful to look back…and I REMEMBER that feature in CPS….funny to see it now, because at the time I didn't even know you !! Those were the days my friend! Happy Dances and excited emails flying back and forth. Im still so proud of you and I see from your comments you are well loved and have endeared yourself to many. Im so glad that your beautiful heart is seen through your art and inspirational encouraging words. Hugs from me as always. Thanks for sharing your "blast from the past". I hadn't realized that you started your blog just a few months before me. You've done so much & your work is very beautiful. I think you deserve all the recognition.Here's to much success with your future artistic endeavors. 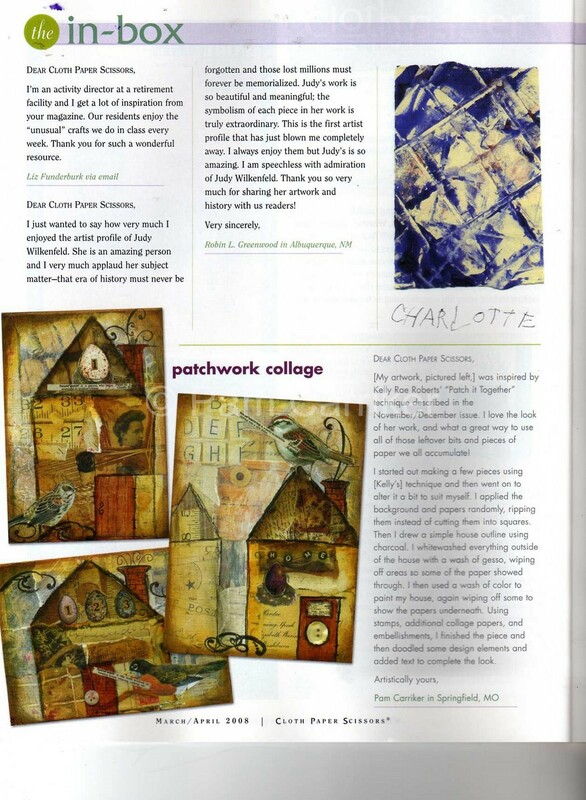 your collages published in this month's CPS mag are just wonderful! i love the rich warm colors on the whitewashed background. congrats on being published (again)! 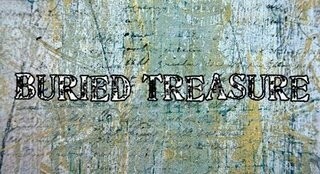 I absolutely LOVE your art journal pages and just had to come back and see what your buried treasure was. Congratulations on publication. You deserve it. Your art is spectacular.Glad to hear that Bleubeard has a "twin." I'm sure yours is far better behaved than mine, though. He wants to make art and ends up making messes! !Again, I LOVE your blog and will be back often. art journaling is a practice of mine too – one that I can no longer live without ! I am only on my third one but it has brought me far in my life journey and in my artist life too. It was great to see where you have come from, Pam ! Thanks for sharing your buried treasure with us ! Cheers ! This was such a fun post to see. Your journal pages were beautiful from the beginning. It is fun to see how they progressed. You are such a gifted artist with a beautiful heart! !